The Belstead is one of the Best hotels in chennai with more than 65 amazingly crafted rooms and suits for your memorable stay. Based on your choice of comfort and number of persons to stay, rooms can be chosen by you from the kinds of rooms namely the Elite room, Elegant room, Twin bed room, suite room and family suite rooms. The 3 star hotel in chennai caters more than level of 3 star grade amenities and facilities for the guests. Dining in The Belstead offers you with two unique choice offering vintage style of dining with wide array of delicacies. The Belstead hotel in chennai offers numerous facilities like Free wifi, In-room safe, room service, premium toiletries and more. 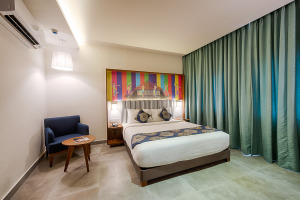 Enjoy your stay at one of the Best hotels in chennai, The Belstead. Visit the luxury hotel in chennai, The Belstead to make your stay memorable and comfortable.